Curdgratulations To Our New Certified Cheese Professionals! Murray’s Cheese, along with our partners at The Kroger Co. announced today that 29 team members have been named Certified Cheese Professionals by the American Cheese Society (ACS)! 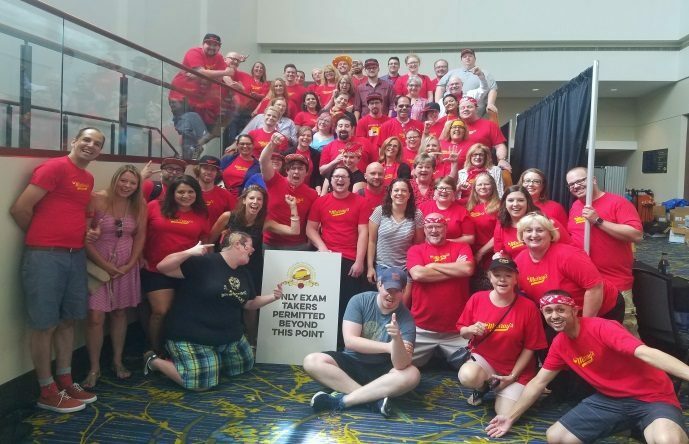 They are part of an elite group of 155 individuals who passed the 6th ACS Certified Cheese Professional Exam on July 27, 2016 in Des Moines, Iowa. Across the US, Canada, and Europe there are now 740 total ACS CCPs! The ACS Certified Cheese Professional Exam is the first and only exam of its kind. It was launched by the ACS in 2012 to encourage high standards of comprehensive cheese knowledge and service for all areas of the industry. Testing encompasses a broad range of topics, including raw ingredients, the cheesemaking process, storing and handling cheese, marketing and communications, nutrition, regulations and sanitation. Congratulations to all these brilliant curd nerds! Previous PostPrevious Financial Times Features Murray’s! Next PostNext Grub Street Writes About Annelies!